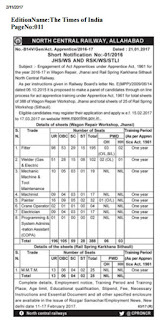 North Central Railway Recruitment 2017 north central railway official website www.ncr.indianrailways.gov.in उत्तर मध्य रेलवे भर्ती 2017 north central railway vacancy 2017. north central railway jobs 2017. north central railway apply online 2017. north central railway application form 2017. north central railway application form download. 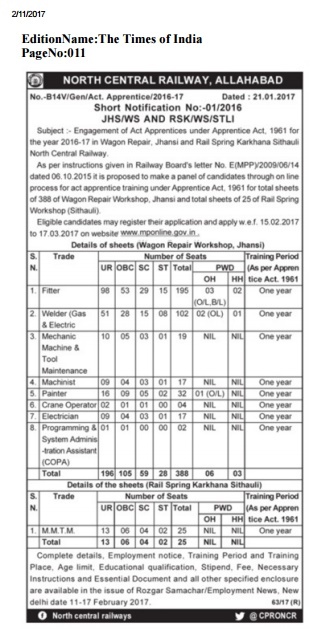 North Central Railway, Jhansi invites application for the post of 413 Act Apprentice for the year 2016- 17. Interested candidates may apply Online through the website www.mponline.gov.in from 15.02.2017 to 17.03.2017.